Hungary are in a U16 European Championship semi-final match for the first time since 1976. 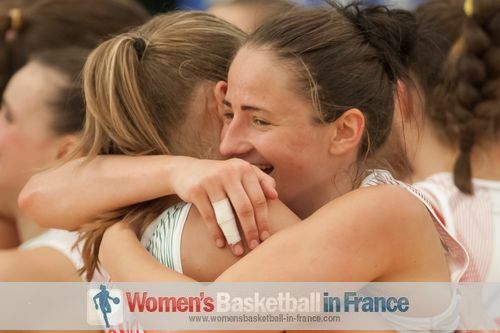 They beat Croatia (75-50) and face Spain for a place in the final. In 2012 Spain eliminated Hungary during the quarter-final stage (57-55). Hungary did not allow the suspense to last long. After dominating the first quarter (21-7), they opened up a 30-point lead just before the break (48-18) on the back of a 14-0 run. Hungary's shooting was top rate during the first 20 minutes with 19-from-33 shots hitting the target. Croatia on the other hand managed just 7-from-33. Dean Nemec, the coach of Croatia, made a number of tactical changes during the second half of the match which stopped Hungary from blowing his team away. Eniko Kuttor (in picture) from Hungary was too strong for Cratia to handle. She scored 23 points all inside the paint while also collecting 16 rebounds of which 8 were offensive. Virag Weninger was the only other player in double digits with 10 points while Debora Dubei dished out 5 assists. For Croatia Iva Slonjsak and Tihana Stojsavljevic (11 rebounds) with 14 and 11 points were the only players in double digits. 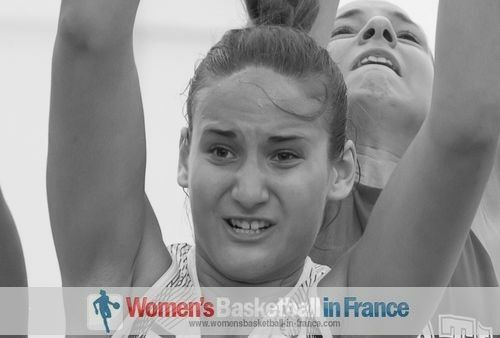 Croatia meet France in the 5th - 8th place classification round.